Are you struggling to find a consistent source of new business leads? Do you feel a sense of uncertainty in your business because you don’t know where your next sale is coming from? I want to share with you one of the most effective strategies to attract new leads and customers so that you don’t have to spend so much money on advertising with little to show for it. The TLC Formula will help you to deliver the right message, to the right audience, at the right time on autopilot so that you can focus on doing what you do best – working to serve your customers. Cold Traffic– that is people who don’t know you nor your brand. Warm Traffic – these are people who have touched your brand in some way and have shown interest in your offers. Hot Traffic – these are your converted. They have purchased at least one product and are ready to buy more. We are going to focus on Cold Traffic because this is where you will be getting your leads, and its where most business people get it absolutely wrong. The problem is that when they create their videos ads they try to sell their product or service to a cold audience. So they’re conversion rate is very low and it ends up costing a lot of money and it makes their campaign virtually unprofitable. And then they tell everyone video ads don’t work. They’re just using the wrong tactic. Well I’m going to show you the right way. Cold Traffic means, the audience doesn’t know you or your brand. Now I know that can be hard to believe but with billions of people online, its not easy to get everyone to know you unless you are a Google, Apple, Amazon, Coca Cola or McDonalds then you are going to have cold traffic. You can target cold traffic based on their demographics, location and interests. You must be as specific as possible. They may also be based on similar audience to your email list or custom audience on Facebook. This maximizes the chances that they will be interested in you – but remember , they still don’t know you. You need to introduce yourself and business to them. Be authentic and transparent so that they can get to know you, like you and build trust. This is your brand building relationship stage. For the initial contact, your number one goal is like every relationship, is to get to know each other without being salesy. You must also position yourself as an authority in your niche. It’s all fine if they think you’re a great person, but if you want to give them value in exchange for revenue, then you need to establish your credibility for them to listen to your offer. Whilst Your Call to Action is placed the end of your video, in the planning stages, it’s the first thing you want to look at. This is what you want your viewer to do. That is with the video’s objective. 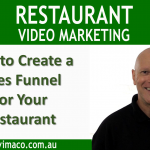 Then create the rest of the video content so that it moves naturally into the CTA. This will maximise the conversion rate of your CTA, because it is so be highly relevant to the rest of the video. With the Cold Traffic, you will want your CTA to send your audience to your website for more free, un-gated content. They learn more about you by looking at more of your other content, your About page, they will also learn about your products and services without and sales pressure. Think of your website as your shop. It’s like someone physically coming into your shop, you ask them if you can help, and they reply, they’re just browsing. If you add too much sales pressure on them, they are going to feel uncomfortable and walk out. So you need to give them room and relax and if they find something they want, then you help them with the sales transaction. Now the difference between browsing a physical store and your website, is that you can learn something about them by using a Facebook or Google pixel which means you will be able to re-target them with ads based on what they chose to consume on your website. So in fact you are segmenting them based on their interest and you can show them a specific ad that’s in line with their interest. That’s why it’s not vital to have them optin to your email list at this stage, when you can re-target them with your paid ads. In Facebook, videos typically have a higher relevance score, and the higher your relevance score, the lower cost per click. Have text in the opening 5 seconds so as your video is on autoplay, viewers will know what it is about and click to play it. Do use any buttons as audiences will think it’s just an ad rather than valuable content. If you are using Facebook video ads to your Cold Traffic, then you should select “Video View” as your objective in the Power Editor. Facebook will optimise the target audience most likely to watch your video. These videos should be full of valuable content. Now at the moment, when viewers watch your video for 10 seconds or more, will be able to re-target them using the Custom Audience. Because they are now warm traffic, you want to select the video’s objective as ‘website conversion’ so that you can optimise your audience conversion on a landing page so that they can optin for a lead magnet to build your email list. In this video we identified the three different types of audiences – Cold, Warm and Hot and we focused on the Cold Traffic which is your source for new leads and how to provide with value first the start the relationship. But it is also critical to understand how to nurture your leads through the Warm and Hot phases using targeting on Facebook and remarketing on Youtube, based on the interest they have shown for your products. And I will teach you all of that, plus more in a free Webinar (see link below). This is an action packed training session that will help you to guide your new leads into repeat customers, so that your business will continue to grow to strength to strength. I look forward to seeing you at the TLC Formula Webinar.